Tag Archive | "Red Line Rasbora (Rasbora pauciperforata)"
The Red Line Rasbora (Rasbora pauciperforata) is found in the still, slow moving, blackwater streams, rivers and lakes of South east Asia, Malaysia, and Sumatra. They prefer overgrown, dimly lit, slow moving streams with overhanging vegetation. 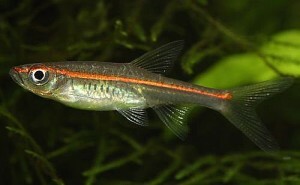 The Red Line Rasbora is an elongated fish with a forked tail. The body is a brownish gray color with an olive brown back and a white belly. The fins are a smokey gray. 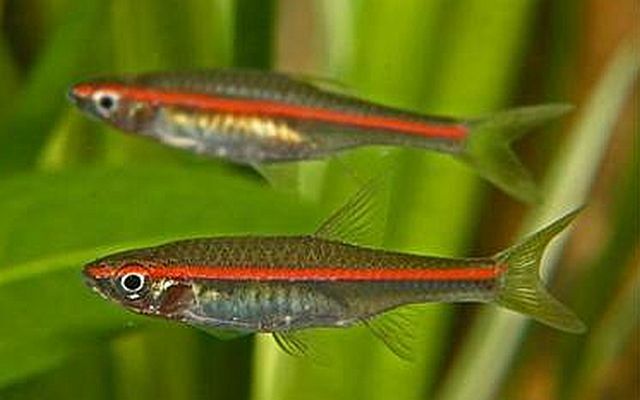 The Red Line Rasbora develops a bright neon style red stripe that runs laterally from the tip of the snout, through the upper part of the eye to the caudal fin when the fish is in good condition. Females are generally more plump than males, especially during spawning. Tropical fish keeping enthusiasts sometimes confuse the Red Line Rasbora (Rasbora pauciperforata) with the unrelated Glowlight Tetra (Hemigrammus erythrozonus). Among other differences, Red Line Rasboras have a brighter red stripe than the Glowlight Tetra. Red Line Rasboras are a peaceful schooling fish that swim in the middle and upper water levels of the aquarium. They do best in groups of at least 8 or more individuals and can be housed with other peaceful similarly sized species such as Colisa, Corydoras, Apistogramma, Loricarids, Loaches, Danios, hatchet fish and other Rasboras. Although they are sensitive to pollutants and require frequent partial water changes, they make an excellent addition to any black water community aquarium. Red Line Rasboras should be housed in at least a 15 gallon tank with a dark fine gravel or sandy substrate, that is densely planted and aquascaped with some smooth river rock, driftwood or bogwood logs. Allow them plenty of swimming room. Peat filtration and a cover of floating plants like water lettuce is recommended to give them the low light conditions they require. Red Line Rasboras have been bred in an aquarium environment but breeding them is extremely difficult. They require a pH of 5.5-6.0, a water hardness of 2-3 dH, a water temperature between 79-84°F and a well planted tank of fine leaved or grassy plants. Because Red Line Rasboras are very selective about their breeding partners, it is best to keep a large number of fish together in a school and watch for pairs to develop. These fish are egg scatterers and will deposit their eggs on the plants and among the grasses in the tank. The eggs normally hatch in 24-28 hours and the fry will be free swimming 3 to 5 days later. The fry are very sensitive to water changes and should be fed infusoria, rotifers or liquid foods until they are able to fend for themselves. Red Line Rasboras are not picky eaters and can be fed a mixed diet of live, frozen or freeze dried insects, tubifex , daphnia , insect larvae, crustaceans along with a high quality flake food. When available for purchase, Red Line Rasboras can be anywhere from 1/2″ to 2-1/4″ in length.